In the first hour, host Nathan Sather visited with Jim Boulger of Boulger Funeral Home about why we should start looking into planning our funeral. Nathan also spoke with Bishop Paul Sirba of the Diocese of Duluth about the upcoming Built Upon A Rock Fest. Finally, our host joined Deacon Carl Provost to talk about the upcoming Theology Uncapped events, a series of theological discussions which will review both the Catholic and Protestant perspective on certain topics. In the second hour, hosts Roxane Salonen and Fr. Charles LaCroix continued our discussion on the Theology of the Body with Bishop John LeVoir of the Diocese of New Ulm, focusing on how it works its way back to the central theme of a relationship with Jesus. Our hosts then spoke with Kathy Kramer about the Fall Festival coming up at St. Anthony's Church in Linton, ND. Finally, Fr. LaCroix recapped this past Sunday's Gospel reading from Matthew. 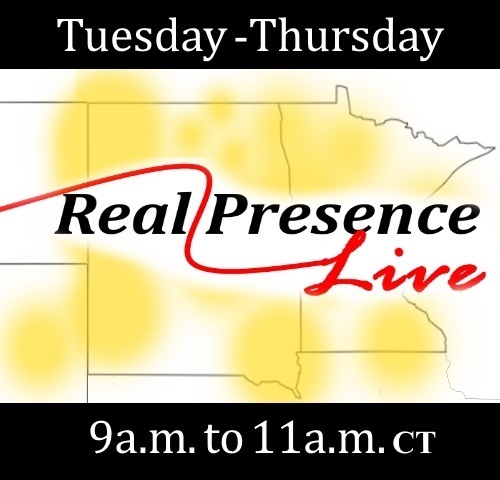 In the first hour, hosts Roxane Salonen and Fr. Charles LaCroix began by speaking with Msgr. Dennis Skonseng and Ken Reed about Catholic second hand stores and how they help local communities. Next, they spoke with Nadia Smetana about the upcoming Dakota Hope Clinic fundraising banquet in Minot. Finally, our hosts visited with Fr. Richard McAlear about his healing ministry and the healing retreat he will be leading at Blessed Sacrament Church in Rapid City. In the second hour, hosts Brad Gray and Jeanine Bitzan spoke with Chris Bermingham & Rosemarie Dykeman about how they help couples heal and renew their marriages through their program, Retrouvaille. To end the show, our hosts talked with Amy Julian, Director of Family Life Ministries in the Diocese of Rapid City, about the importance of celebrating married life and how the Diocese of Rapid City seeks to honor husbands and wives. In the first hour, hosts Brad Gray and Jeanine Bitzan talked to Mirco Morganti, Chef at Toscana restaurant in Downtown Fargo. They talked with him about his love of cooking and about some tips for cooking an authentic Italian meal. After that, our hosts visited with Tim Staples of Catholic Answers about his upcoming visit as keynote speaker at the THIRST 2017 Men's Conference in Bismarck. Finally, we continued our Fall Festival Tour as Brad and Jeanine spoke with Kaitlyn Speiser about the St. Clara's Fall Get Together in Clara City, MN.